Sorry for the lack of posts this week. I decided to paint my house this week and of course, I started out with wanting to just paint the living room. This quickly evolved into more paint and more rooms. I'm almost done though and it looks so much better, so I am happy. There's nothing like a little bit of paint to completely transform a room. So back to the food. One of my kids favorite foods is shrimp. They could literally eat two pounds of shrimp all by themselves if I let them. Since shrimp is on the expensive side I limit our shrimp consumption to approximately twice a month. 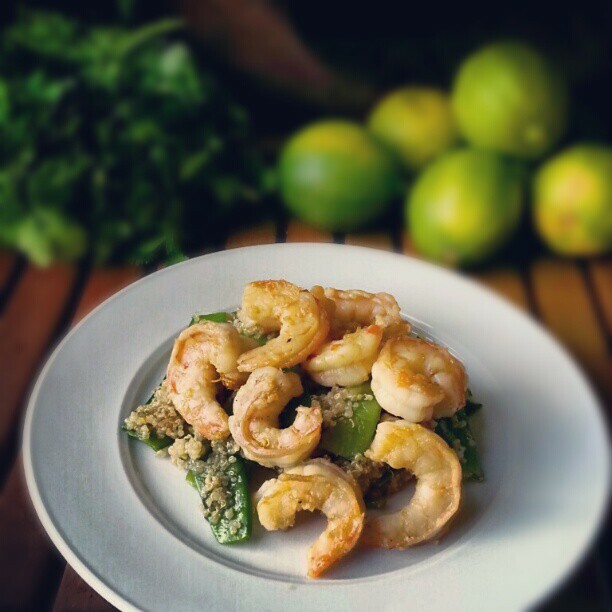 I also like to try new recipes as often as possible so each shrimp dish feels and tastes like something completely new. My taste buds seems to get bored very quickly and variety is key, especially with shrimp since we eat it so frequently. Recently, I tried a new recipe for Apricot Lime Glazed Shrimp from the July issue of Family Circle magazine, which with 5 grams of fat and 33 grams of protein per serving looked like the perfect healthy dinner option. This recipe has 9 ingredients. It takes 15 minutes of prep and 15 minutes of cooking time and makes 4 servings. I had no problems finding any of the ingredients at my local grocery store and I made no ingredient modifications. Since I eat gluten free I buy gluten-free soy sauce, a lot of cheaper brands use wheat as a main ingredient. Instead of white rice I served the shrimp over brown rice, we only eat white rice in limited amounts. Brown rice also cooks great in the microwave which I love! To grill the shrimp I used an indoor grill. I love my indoor grill it is so much easier than going outside, especially in the winter. I followed the remainder of the recipe as written. My two sons really loved this dish. While, I like snow peas I would have preferred sugar snap peas in this recipe. The additional sweetness would have been delicious. This recipe only makes 6 shrimp per person, so I would suggest doubling the recipe if you want larger servings. The best part of this recipe was the quick prep and cook time. With only thirty minutes of total time, it makes for a great weeknight meal. Oh my goodness! That looks so wonderfully delicious. Pinning this to my pinterest board right now! Thanks :) It really did turn out well! This looks so good, I hate shrimp but it's making me want to try it! Stopped by and followed you back :) Come back again soon! New follower here. LOVE LOVE LOVE your food photography! Pretty and delicious! Now I'm hungry again... thx! Thanks for the sweet comments, I already follow you :) Come back again soon! Thanks :) It was very easy, which I love! This looks amazing. Will try soon! It really is a good recipe, my two boys particularly loved it! Looks yummy, this Southern Girl loves shrimp! Thanks :) I love shrimp also! Hi Ann, its my first time on your blog...only been on here for maybe 5 mins and feel like I can't take the fact that I don't have all of this amazing food in front of me NOW! Thanks for the sweet comments :) And for stopping by and taking the time to comment. I really do love meeting other people online that love good food!